The Taste of Home Cooking School Cookbook: Full Color and Everything You Need To Bring Your Cooking to the Next Level! For years, my husband and I have had a really old set of cookbooks that had great how-to instructions and photos that we have loved and relied on, but that all changed with the Taste of Home Cooking School Cookbook, which has beautiful step-by-step instructions (most of which have full color photographs) and scrumptious recipes just begging to be mastered and shared. Did I mention the full-color photographs? And how many there are? That is what sets this book above a lot of others. With the exception of the index, I do believe that every single page (there are 320) has at least one full-color photo. I'm fairly picky with my cookbooks now, and I really do value those that take the time and resources to include what a dish is supposed to look like. Sure, my version of the dish very rarely looks as nice, but a picture can help us know what things are supposed to look like when they are done, and they can occasionally help us figure out something that is stumping us. Speaking of stumping, I don't think you can be stumped with this Cooking School Cookbook, because there are such great instructions for how to do things (which include pictures as well) step-by-step. This includes some basics in the introduction, like how to measure different ingredients the correct way (shown below), and How-To's, Tips and Information shared throughout the book in the outer margins. In addition to great instructions with full-color pictures, the book has a great variety of recipes that cover simple to extravagant in each main area: Appetizers, Drinks, Better Than Takeout, Soups, Beef & Pork, Poultry, Seafood, Vegetarian, Side Dishes, Breakfast, Baking, and Deserts. This cookbook would be a great gift, or a great addition to anyone's kitchen. (Shhh - I'm actually thinking about replacing that old set we've been using for years). Edition Reviewed:Paperback - Review copy received courtesy of the FSB Associates, many thanks to both the author and the publisher for sending me a copy to review! Learn to cook with confidence with The Taste of Home Cooking School Cookbook based on the popular Taste of Home Cooking Schools attended by millions. The Taste of Home Cooking School Cookbook, "is just like having a Cooking School instructor in your very own kitchen," says Catherine Cassidy, Editor in Chief, Taste of Home. "This essential cookbook captures the highlights of our cooking school lessons and presents them in a way that allows people of all skill levels in the kitchen, to create memorable holiday meal moments in their own homes with family, friends and neighbors." Learn fresh techniques, tips, secrets and entertaining ideas straight from the Taste of Home Cooking School team. Each chapter builds from simple, beloved classics to spectacular dishes handed down by families from generation to generation that are sure to impress family and friends. Better yet, all of these recipes can be created with affordable ingredients available at your local grocery store. As you move from one recipe to the next, you will enhance your cooking skills and discover new favorites. Catherine Cassidy, Taste of Home Editor-in-Chief. Catherine M. Cassidy is Editor-in-Chief of Taste of Home, overseeing the development of four national cooking magazines, the entire book program, and more than three-dozen newsstand specials, "bookazines," and wall calendars. She has toured the country doing events and national and local TV, radio, and newspaper interviews in support of the best-selling Taste of Home Cookbook, Taste of Home Baking Book, and Taste of Home magazine. Most recently she has been named One of America's 50 Most Powerful People in Food, for the second year in a row, according to The Daily Meal. Taste of Home’s unique staff of field editors is made up of more than 1,000 experienced home cooks located in each state and Canadian province, who regularly share recipes, well-liked menus and kitchen tips. Taste of Home is published six times a year and has five sister magazines, Simple & Delicious, Slow Cooker, Appetizers, Cooking for 2, and Healthy Cooking. Super Food Ideas Magazine: An All-New Favorite Magazine of Mine! I have got an all-new obsession! I was using my free $5.00 voucher on Zinio, a great digital magazine provider... and I found an Australian magazine called Super Food Ideas that is now one of my all-time favorite magazines (I think I paid a whopping $3.18 for a year's subscription after applying my voucher). It is FULL of yummy looking/sounding food. The December issue (available now) has 421 recipes and ideas and I haven't made it through the whole thing yet! Here is one of the salads I want to try (the one on the left... well, I want to try both, but I'm going to start with the one on the left). It is a Rice Noodle, Chicken and Pineapple Salad that takes approximately 20 minutes to prepare. So, today I learned the hard way (after a few very painful days) that we have such a thing as a Tear Gland, that is kind of on the outer edge of your eye behind your eyeball. When I get stressed and tired, I tend to get Styes in my eyelids, which are very painful, but easily treated (basically, kind of a clogged folical in your eyelash area). This one was different. It was in the outer corner of my eye but INSIDE my eyelid. I treated it how I normally would for a Stye and .... nothing! I then put hot water on my face in the shower and it stopped hurting! So I looked up the anatomy of an eye and saw a Tear Gland around that area... so I looked up clogged tear gland and found that it IS possible and does happen on rare occasions. To fix a light case, hot compresses and massaging the gland a few times a day until it is gone will generally work. I tried it, and have done it twice today, and it feels MUCH better. I've been wanting to try adding sayings and other accents to my walls in a more professional way than stencils (don't get me wrong here, I love stencils and they work well on a lot of walls, but I tend to have problems with them bleeding under the edges due to the type of finish our walls have), and I got the opportunity to do that via an online store called Vinyl Disorder. This is our master bedroom - yes, I need to repaint - when we chose this light green, we didn't know that it would turn a kind of gentle neon when the light over the sink was turned on. Lesson learned, will use a more muted color soon. The saying above our headboard is from Vinyl Disorder and I LOVE it! Not only does it look great, but it was easy and FAST to put up. Plus, when I ordered it, I chose the type of decal that can be removed and reapplied to the wall, so when I'm ready to paint, I'll pull it up, paint, then put it back. This decal is 36 inches and costs $25 from Vinyl Disorder. Different sizes are available, starting at 15 inches at only $10. They have 20 different wall colors, 20 car colors, and 6 specialty colors available. Looking for decals for the playroom, a special theme, or for your car or craft project? Vinyl Disorder can help! They have a wonderful selection of pre-designed decals, and give you the option to design your own. For my next project, I'm thinking of a pretty family tree design that I can hang small pictures around to create a wall of family photos. They also have some GREAT holiday themed decals that would be nice to put on the walls and then remove when the holidays are over. Edition Reviewed: Vinyl Decal - I received a review sample of my choice under 36 inches as part of a review campaign with Outburst Media. All opinions and pictures are my own! Vinyl Disorder creates vinyl artwork and decals that can be used on walls, cars, and crafts, as well as stickers, banners, and much more. They use high quality vinyl products and create your products right before they ship it to you. Shipping ranges between $2.00 and $5.00 and if you spend $50+ you can select Free Shipping! Zinio is giving away 3 iPad Minis in the next couple weeks and everyone who enters to win will get $5 towards a magazine subscription of their choice (single issues and yearly subscriptions are available through their site). They have also launched their Black Friday deals. There are 230 magazine titles available at up to 50% off our already-discounted prices. A few of their titles include: TOP GEAR, FOOD HEAVEN, O Magazine, CRAFT, QUILTING ARTS, HGTV, OK! Weekly magazine, and CROCHET TODAY! They have 5500+ magazines available, so you are sure to find some favorites. Enter to Win a Zinio Magazine Subscription HERE - Multiple Winners! The Silver Cross was a really fun surprise for me. Yes, it is paranormal romance, but with a twist. The heroine, Lacey, is a tough detective working for a Fringe division of the local police, who investigates unusual, usually unexplainable (to the public anyways) and bizarre crimes. She worked hard to get there, after her sister was attacked by a vampire, she made it her mission to go after vampires and make the streets a safer place. She also has a dark side of one-night-stands that sometimes turn out horribly (so thank goodness for a partner who is determined to watch her back even off-hours)... until she meets Damon, the mysterious bar owner who wears a beautiful silver cross. Then it seems to be love-at-first-sight in a challenging kind of way, with plenty of hurdles, including finding out that her would-be perfect fling just MIGHT be a vampire... but how can that be when he is out in the daylight? I loved everything about this story - the build up was great, the characters are perfect (yes, even the bad guys are written really well). I became so engrossed in the story, it was hard to see it end, and I can't wait for the next book! I did think the end was a bit abrupt and left me dangling with questions of what happens next, but I guess that is probably the point of book one in a three book series. Loved this book and can't wait for book 2! Edition Reviewed: eBook - Review copy received courtesy of the author and Promotional Book Tours, many thanks to both the author and the publisher for sending me a copy to review! There are two things Boston detective Lacey Gardner knows about killing vampires. Slicing off a head or a hit directly to the heart are the only surefire ways to kill one. Silver is their Achilles heel. A vampire never wears silver. When she meets bartender extraordinaire, Damon Harte, her heart does a quickstep for the dark hunky guy. She’s learned the hard way that having a love interest in her line of work can be heart-wrenching. She’s kept to herself for years, but something about Damon captivates her and draws her to him. When she learns Damon’s devastating secret, she knows what she has to do: kill the man who has stolen her heart. Debra lives on the East Coast with her husband and 2 cats. She works as a Programs Manager at a research university. David lives on the West Coast with his wife. He retired from the Marines after 21 years and currently works as a Network Specialist. Treat.com Greeting Cards: Two Days Only - Get Your Free Greeting Card! Treat.com is Shutterfly's new greeting card brand that brings you the freedom to create and send your own custom greeting cards. Customized greeting cards are great for all occasions, including birthdays, holidays, Christmas, baby showers and so much more! With the holidays just around the corner, I think it is safe to assume that we all have a few people we would love to send a personalized card to, and Treat.com would like to help! Today Monday 11/19 thru Tuesday 11/20 to create and send your own custom greeting card for FREE and make someone's day a little brighter! Today, I had a chance to talk with our son's Kindergarten teacher in passing. I hadn't thought about some children not having the ability to participate in things like the Scholastic book orders or Popcorn Friday until my husband asked our son if any of his friends didn't get to bring home popcorn on Popcorn Friday. When he mentioned two friends, it made me wonder, so I asked his teacher if there were any children whose families were unable to pay for those fun treats. You see, Popcorn Friday is only a few dollars, and Scholastic books on special are sometimes as low as $1.00. Our son's teacher was able to confirm without sharing any names that there are a few children who don't get to participate in those activities, so on Monday, I will be taking in money to sponsor 3-5 children's Popcorn Friday, and with our next Scholastic Book Order, I will be ordering extra copies of Corduroy's Christmas Surprise, which costs only $1.00! I will be asking our son's teacher to put the books into the backpacks of those children who never get to order books so that they too get to experience the excitement of taking a book home! I have also picked up multiples of some of the Disney Wonderful World of Reading books that we collect, and we will be donating them to our son's classroom. I encourage you to speak with your child's teacher if you are able to share a book order book, or buy a special treat, and see if there are any children who would not otherwise get to participate in fun extras at school, because I remember those as special and exciting days from my own school days, and I hope to share those memories with others. I've had the pleasure of reading and featuring some of CH Admirand's books here on Wendi's Book Corner, so it is with great pleasure that I get to host a guest post written by her today. Hi Wendi, thanks for inviting me to guest blog today about the challenges/benefits of writing about a small town. For me, thinking in terms of a small town was very easy. Having grown up on Cedar Hill, a small community of 25 homes on dead-end streets in a tiny corner of Wayne, NJ…if you didn’t live on Cedar Hill, you really didn’t have any reason to drive up there. We always felt as if we were a world away from everyone else in town. We were always the last neighborhood to see the plow whenever there was a snow storm…and boy did we pray that it would be as close to lunchtime as possible so that we’d have to stay home. For the last 30 years, we’ve lived in Lindy’s Lake—a small lake community in West Milford, NJ. The lake had a wonderful mix of long-time residents and new residents just starting out and having families. There were five of us pregnant at the same time, so our kids attended pre-school through high school together. Before pre-school we started our own play groups and then decided our lake needed an arts and crafts day for kids. So many fun activities and all within walking distance to the Manor House…our lake’s community gathering place. The sense of community is what has always been the strongest in the neighborhood where I grew up and where we raised our family, and that is what I wanted to make sure I convey to readers…that marvelous sense that your family, friends, and neighbors care about you and for you. I love embracing that aspect of small town life and hope readers will enjoy reading about small town life in Apple Grove, Ohio. He's not so sure about small town life. She can't imagine living anywhere else. Welcome to Apple Grove, Ohio (population 597), where everyone has your best interests at heart, even if they can't agree on the best way to meddle. When the townsfolk of Apple Grove need handiwork done, there's no job too small for the Mulcahy sisters: Megan, Caitlin, and Grace. Specializing in hard work and family loyalty, tomboy Meg Mulcahy has left behind any girlhood reams of romance. Enter newcomer Daniel Eagan, looking to bury his own broken heart and make a new start. He's surprised-and delighted-by the winsome girl with the mighty tool belt who shows up to fix his wiring. 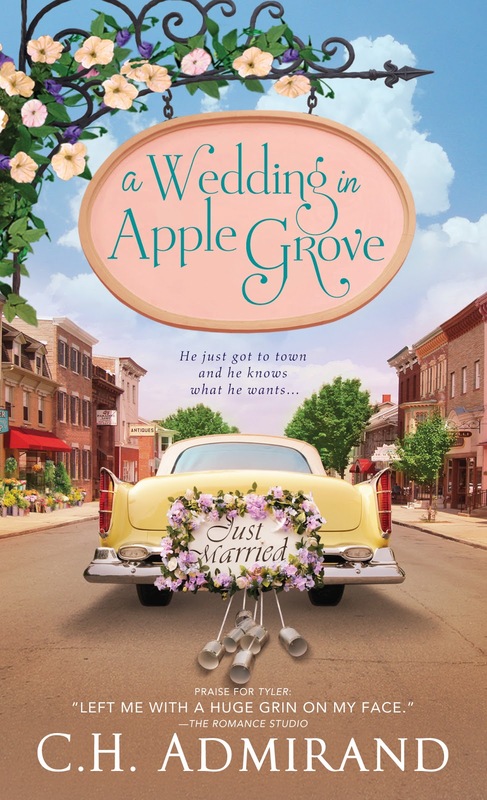 But Dan's got a lot to learn about life in a small town, and when Meg's past collides with her future, it may take all 595 other residents of Apple Grove to keep this romance from short-circuiting. C.H. ADMIRAND was born in Aiken, South Carolina, but grew up in New Jersey. She has been delighting readers with her Secret Life of Cowboys Series, featuring three cowboy brothers with Irish charm, and is now working on the next books in her small town contemporary romance series, featuring the town and quirky characters of Apple Grove, OH. She lives with her husband, who is the inspiration for all of her heroes’ best traits, in New Jersey. For more information, please visit www.CHAdmirand.com. I'd like to extend my deepest thanks to CH Admirand for taking the time to visit with us! 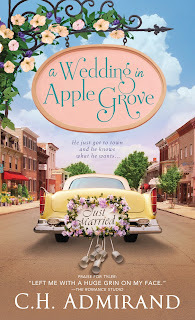 Giveaway Details: One lucky winner will receive a copy of CH Admirand's A Wedding in Apple Grove. Open to residents of the US and Canada, enter now through 11/30, midnight EST. The Dreamworks How To Train Your Dragon Live Spectacular is coming to the Tacoma Dome, here in Washington, December 6th through December 9th! Inspired by the movie How To Train Your Dragon, this live-action show brings to life your favorite characters, including 13 dragons, some of which fly and breathe fire. To add some perspective to how massive this show is, the backdrop is the size of 9 movie screens. To see the dragons and vikings, visit the Dreamworks How To Train Your Dragon Live website and see how the dragons were made, who plays the characters, and watch special videos. Barely contained within the arena, the production utilizes the full venue, maximizing every dimension of performance space to transport audiences into a mythical world of fire-breathing dragons who soar overhead at great speeds. The state-of-the-art animatronic technology and large-scale cinematic projections interact seamlessly with the live actors to bring the story to life. The show features 23 dragons, some with wingspans of up to 46 feet, Viking warriors and world-class circus artists and acrobats, to perform against a state-of-the-art, wall-to-floor immersive projection measuring more than 20,000 square feet. Produced by DreamWorks Animation, RZO Dragon Productions and Global Creatures, the masterminds behind Walking with Dinosaurs, proudly presented by S2BN Entertainment. Tickets start at $21.50 on Thursday Dec. 6th and go up to $269 for the "Meet The Dragons" Experience, which includes a behind the scenes tour, special meet and greet, pictures in costume with a special How To Train Your Dragon backdrop, VIP parking, a VIP gift bag and more. Visit Ticketmaster to get your tickets. Disclosure: I am excited to share the Dragons experience with you. I'm posting a series of posts in exchange for tickets to the show on opening night.